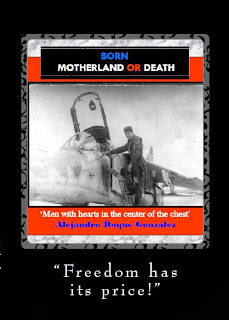 Alejandro's Libros: Born Motherland or Death. 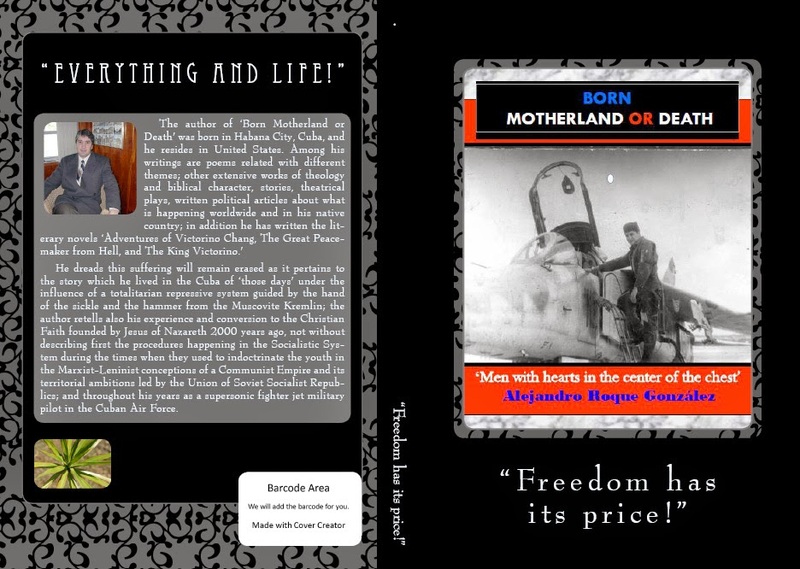 The book consist in a biography narrating author's life since childhood in Havana City, Cuba after being born under a Socialist-Communist dictatorship, then the years on communist boarding schools with interesting and funny stories, later becoming a jet military fighter pilot in the ex Soviet Union including flight training narratives, poems, and finally confronting the "Gestapo" of the Cuban dictator behind bars, with interviews and pictures. 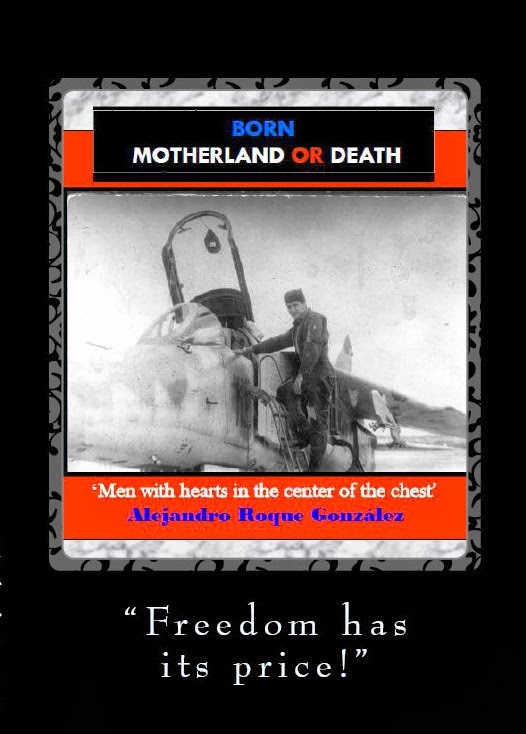 The title in English translates as "Born Motherland or Death" which was a common slogan used in society, even still today after many years, and by the Cuban dictators and their blind followers. -Chapter II: My Childhood and Adolescence. -Chapter III: Aspiring to be a Pilot. Political Verifications. -Chapter IV: My Friend Lenin. Military Air Force Institute. -Chapter V: Cuba, First Socialist Country in America. -Chapter VI: Jesus knocks on my heart’s door for third and last time. -Chapter VII: Jesus Christ, Myth or Reality? -Chapter VIII: If the Apostles were not speaking the truth, then they were Demented. He dreads this suffering will remain erased as it pertains to the story which he lived in the Cuba of 'those days' under the influence of a totalitarian repressive system guided by the hand of the sickle and the hammer from the Muscovite Kremlin; the author retells also his experience and conversion to the Christian Faith founded by Jesus of Nazareth 2000 years ago, not without describing first the procedures happening in the Socialistic System during the times when they used to indoctrinate the youth in the Marxist-Leninist conceptions of a Communist Empire and its territorial ambitions led by the Union of Soviet Socialist Republics; and throughout his years as a supersonic fighter jet military pilot in the Cuban Air Force..."
"...I will never forget my second parachute jumping. When you jump suspended in the emptiness, and not yet the parachute has been opened, the sensation is a little bit horrifying, as you certainly know that you are in the air on free fall. Seconds after jumping I felt a strong 'alón', pull, and at the same time I was well disabled to move my head vertically, not even able to observe if the parachute cupola was open or not as we had been trained. Very much alerted I thought during fractions of milliseconds: `well there is always in this parachute business a guy who has no luck', and I began imagining the worst thing that could happen. With my 'ballistic impact' on earth surely they would discover for the first time gas and petroleum in that area..."
TAGS: Cuban Air Force, Russian Air Force, Cuba, Havana, Holguin, Mig-21, Mig-23, L-29, Soviet Union, Communism, Socialism, Higher Aviation Institute, Krasnodar, Boarding Schools, G-2, Secret Police, Villa Marista, Castro, Quivicán, Forced Labor Camps, Christianity, Dictatorship, Cuban Prisons.